"In a Wide Sky, Hidden," by William Ledbetter [bio] (edited by C.C. 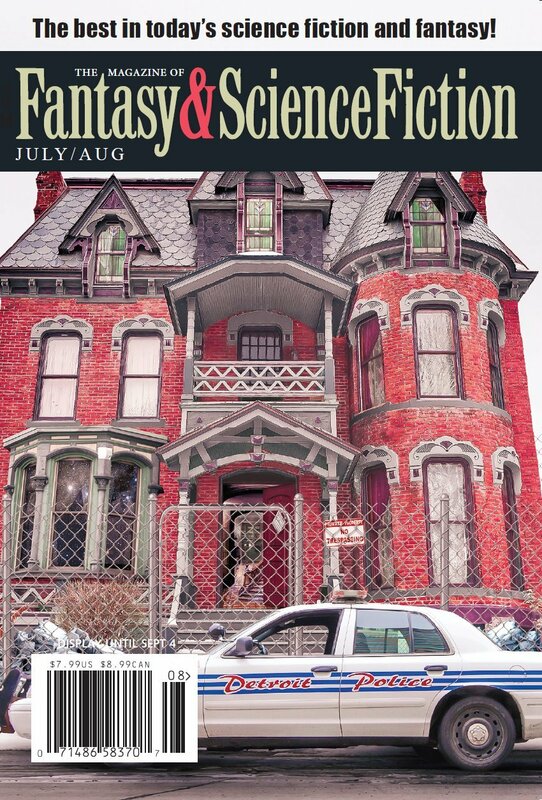 Finlay), appeared in Magazine of Fantasy & Science Fiction issue 07-08|17, published on July 1, 2017 by Spilogale Inc. Pro: It presents some interesting concepts: Both that humanity has lost interest in exploring and that their sister has lured them to follow her to stimulate more interest in exploration. Con: Too many things break suspension of disbelief. Humanity is immortal, but parents are still having children, and yet no one bothers to look for new worlds, so where are all the people going? The quantum copying mechanism has been much discussed over the years, but the idea that it would let you keep your body young turns it from science into magic. The idea that you’d need a human to physically visit a world before you could know whether it had life on it or even what continents it had is hard to believe. It's not that they've stopped looking for new worlds. It's just that the probes do the grunt work of searching and cataloging. The probes kept replicating themselves and launching out further. Humanity wasn't keeping up. Thousands of gates were be created that weren't being used. So laws were passed that a human or independent AI (like Roger, I assume) has to come out and approve each new wave of expansion. Interesting note: Like you, I assumed the narrator was male. But then I read an interview with the author, and he actually uses they/them/their when talking about the protagonist in this story. Skimming back, I see it works equally well to think two sisters or sister and non-binary sibling since the POV is first person. Okay, I'll fix the gender. Was the rest of it in the story (and I just missed it) or was that just your interpretation? Yup, in the story. The point was that the narrator felt pressure not to follow their dream because most people consider exploring machine work beneath humans. I thought the copy was like printing yourself out from the originally saved template made when you were young. Or was that just a justification I created in my head? Ah. I got that part (about exploring being beneath humans) but it still leaves me wondering how a race of immortals that keeps having children can avoid being forced to fill up new worlds. I assume they are fine with filling them up. Just not finding suitable ones in the first place. And the bots were getting ahead of their need for more space. Also, got the impression that maybe fewer people were having children. The narrator seems to suggest that their parents are a little old fashioned having babies and raising them.